Welcome to our Ariel Prize Draw! We're giving away one year's supply of Ariel 3in1 Pods, every month. Fill out our survey and be automatically entered to win! Which washing detergent brand do you buy most often? Do you use Ariel Liquitabs/pods? If the answer is no to the previous question, why is that? Do you see Ariel washing capsules/pods commercials on TV? Contest Rules. You have read and agree to the Prize Draw Rules. You can exercise your data protection rights or change your preferences and subscriptions clicking here. Email Marketing Opt In. You would like to receive emails, offers and coupons from Ariel and other trusted P&G brands. months but restricted to a single entry per person per month. To enter a free monthly prize draw, go to winariel.co.uk between 00:01 on the first date of the month and 23:59 on the last date of the month and ensure your address details are entered and correct, then simply click ‘Enter Now’. The promotion is open to UK and ROI residents aged 18 years and over. No purchase necessary. This Free Prize Draw promotion is open to all residents in the UK and ROI aged 18 years and over, excluding employees of Procter & Gamble UK and its affiliates or agents, the families of such employees and any other person connected with this promotion. Unsuccessful entries will not be carried forward to subsequent months of the promotion; you can apply to enter in multiple months but restricted to a single entry per person per month. No bulk or third party entries accepted. The promotion will run from 00:01 on 1st September 2018 to 23:59 on 30 th April 2020. There will be a prize draw held at the end of each month (i.e. 20 x prize draws in total) with a single winner selected per occasion. To enter a free monthly prize draw, go to winariel.co.uk between 00:01 on the first date of the month and 23:59 on the last date of the month and ensure your address details are entered and correct, then simply click ‘Enter Now’. 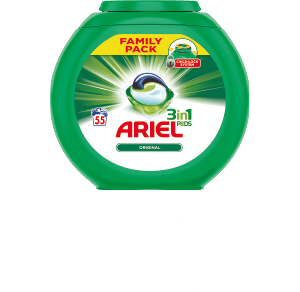 All valid entries received by 23:59 on the last date of each month will be entered into a Free Prize Draw and the first entry randomly selected by an independent person will win a year’s supply of Ariel 3in1 Pods; a year’s supply is determined to be 250 washes. The prize is as stated and cannot be transferred, sold or exchanged. There is no cash alternative. Only one prize will be awarded per household over the promotion period. The prize-winners will be notified within 14 days of the closing date each month. In the event the claim for a prize is not received by the Promoter within 14 days of notification, the Promoter reserves the right to select an alternative winner. Please allow 28 days for delivery after prize claim being received. By entering the promotion, the winner consents to any publicity generated as a result of the prize draw and to images and text entry being used for publicity or promotional purposes including, and not limited to; social media, websites, magazine or mobile services at any time without further consent or payment.